Next time you want to learn a new knitting skill, do not make the first attempt in black yarn. I decided to teach myself how to do a short row heel. I started some striped socks to do this - working the ribbing in black, with the idea that the heel and toe would also be black. Oh, what a folly that was. After much time, frustration, tinking and frogging, I have done my first short row heel. There are a few gaps in it, but at this stage I don't care. I am just happy to have it done. 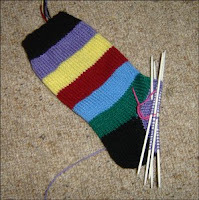 The socks in question are being made from some cheapo acrylic yarn while I try to learn how to manage DPNs. It's slowly getting easier than trying to insert an angry sea urchin into a net bag, but only just. 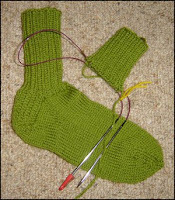 In other news, I am more than halfway through the other pair of socks I am working on. These ones are a lovely wool, but I don't know if I still love the colour. They are green. Very green.